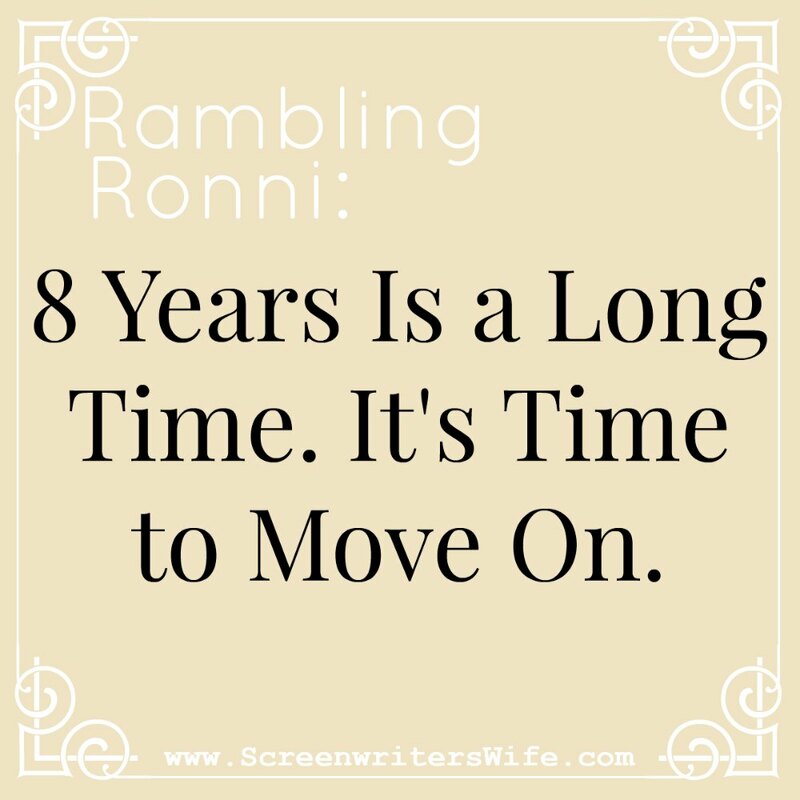 Rambling Ronni: 8 years is a long time. It’s time to move on. Early, early Saturday morning, way before dawn, I woke up. I couldn’t go back to sleep. Filled with an anxiety similar to what I’d felt the morning before the birth of my third child. Knowing that the near future was inevitable, yet it still felt so impossible. Oh, those awful moments of waiting. Of knowing that the then-present would forever be defined as the precursor to what it was that came next. The hours before a baby a born. The days before the big move. On Saturday morning, as I lay in bed, I was overcome with a feeling of the nearness of finality. A thought struck my mind and it wouldn’t leave: What if I die today? What if this is it? What if I never move from this house? What if this is all I’m ever destined to become? I realize that life is not fair. Death comes when it does. It doesn’t wait for us to have accomplished what we want to accomplish, or reached the goal we set for ourselves. It comes when it does. And Saturday morning I was worried that it could come for me. Maybe even today. I almost cancelled on the day’s fun-filled plans with my MOMS Club group. Though illogical, I didn’t want to risk anything happening to me. I didn’t want to risk riding in a car and getting into an accident. I wanted to do all I could to stay alive. For at least just 5 more days. Five days. Heck, it still feels impossible. We’re down to 2.5 days now. I hope this post isn’t jinxing anything. This move is going to be big for us. It’s been hard for me to write about. I haven’t really. Lease is signed, deposits paid, checks cashed, movers booked. It’s legit. It’s happening. But this darn entertainment industry. It’s…hmm, jaded isn’t the right word…it’s “waried” me. Which no, isn’t a real word, but I still think it’s the best word to use, so I’m going to make it up. Past verb tense of wary, a combo of wary and weary. Waired: Cautious, on guard. Often occurring after significant life experience has matured and exhausted you. Wisened. I once wrote a lot about hope. I still have hope. But I feel older now. And when you stop paying attention, optimism gives way to realism. We’re moving in 2.5 days. We moved in here 8 years ago. Before kids. A whole other lifetime ago. I was still in my 20s when we moved into this place. This house has held so much within its walls during our time here. I remember the fights we’ve had. Right there, yelling at each other over the back of the couch. Seeing that unbelievable second pink line, after 2 years of trying, when I thought it might not ever happen for us. This is the spot I told KP I was pregnant for the first time. And where I told him I was pregnant the other four times. This is the spot my daughter was born. This is where my two sons were born. This is where we put the Christmas tree, each of those years. Where we sat when we watched our young kids open presents, beaming with joy and happiness. Where we rediscovered, reestablished, and recommitted to our marriage relationship. This is where we went through career highs and career lows. Where we cried, and loved, and laughed, and yelled. In many ways, this is where we became adults. Real, real, adults. Where we most matured and developed into the individuals we are today. I invited the entire world to judge me in this house. I put myself out there. I started a blog. KP and I wrote a script together, which is possibly the hardest and best thing we’ve ever done together. This house has been so much a part of me. But it’s time to move on. I’m desperate to move on. As much as this house has represented growth and change…it also represents stagnancy. It represents limitation. Holding back. A safety net. We’re leaping into the future. To what will hopefully be a stage of more change, of more growth — but also a time of accomplishment, of settlement, of our arrival. I know that it’s only a matter of time. Boxes are packed. Addresses are being changed. But I’ve been stuck in this stage of life for so long and I’m so ready to move on to the next and we’re so, so, so very close. And I hope the next 2.5 days pass quickly. And I absolutely cannot wait to move into this new house. AHHHHHH, is it moving day yet???? « Rambling Ronni: My house is small. We need to move. We can’t move.